The push is on to sell everyone a smartphone with email, internet, picture and video access. Some people will use them for phone calls. For young and old smartphones are a status symbol. The social pressure in school is enormous as sharing photos and videos is replacing texting as the top activity. 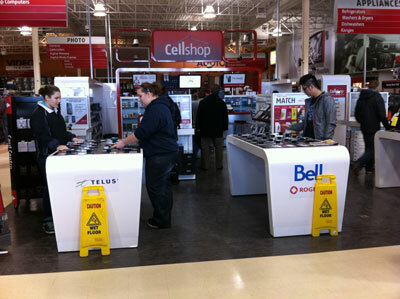 It’s a big business that pays dividends for the phone carriers and retailers like Future Shop and Best Buy. The carriers are kicking back millions of dollars to push these fun but expensive phones. The cost of the phone is irrelevant. They are being discounted to $99 or nothing. Verizon has built a business on giving you the second phone free. Three weeks ago I visited the Future Shop on a Friday night. The smart phone sales department had expanded to fill the front entrance. Impulsively I purchased an Android phone and replaced it the next morning with an iPhone. I had been resisting replacing my iPhone 3 since May 2010. The new sales approach worked for Future Shop and Telus who now are guaranteed to extract $2,400 from my bank account over the next three years. In a social conscious context, the new cost of existence is ridiculous considering the poverty in our society. The maze of phones and plans is what the carriers and phone manufacturers want us to ignore in the store. Here are a few sources to prepare you for that fateful moment when good intentions meets excellent retail marketing. Consumers Reports does an excellent job of summarizing the phones and carriers, with even some comment on the Canadian story, in their January 2011 issue. Their top pics in phones were Droid X, Samsung Fascinate, Samsung Epic 4G, HTC EVO, Samsung Vibrant, Samsung Captivate and iPhone 3. CU has a bug in its ear about iPhone 4 which they should get over. The phone is excellent but get a case to avoid dropped calls. CU found the Windows Phone 7 models fascinating – Samsung Focus, LG Quantum, and HTC HD7. So do I but think they need another 6 months to mature. Engadget is my favourite free source of information on smartphones. They have reviews with hands-on videos and a cool rating system on a scale of 1 to 10. Top pics from Engadget are iPhone 3, EVO 4G, iPhone 4, and Droid Incredible. They vary slightly from CU – Engadget is more for enthusiasts. I found Engadget right on – I hated the Samsung Fascinate. CU rates it highly. CU also profiles phones for people who want to spend $25 a month just for phone calls and texting. Whatever choice you make a little research can save money, frustration and regret down the road. Nothing, however, can prepare you for the pressure from a teenager who will die without an iPhone 4. They should have night classes for parents.